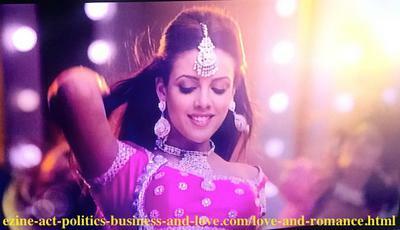 Dancing in India is sometimes a sign of love. I met him a week ago. He attracted me. We laughed together and he whispered his love to me. I feel that I loved him. He takes my breath. I want him badly. I showed him that I care for him and may be I love him more than he does. He disappeared without any explanation. I then called him. Now whenever I call him he never replies. When I caught him up last time, he said to me do not call me back. Please help me. What I should do? I want to go back with him. Please Note: I reedited this entry. However, there is important information that you may need to enter here. In addition, please always start your sentences and names by capital letters. Write short sentences in short paragraphs and enter good title. ** If you wrote this, please write your ages, education, hobbies, cultures, and if you meet frequently, other interests, and anything that can help. Always try to provide more information about the problem. ** It is good idea to enter your email address when you request love consulting. You actually do this when the system asks you if you want to receive replies to your comment. In addition, your email is necessary if I needed to ask you more information. ** Do you have any solution to this kind of love problem? Use the comment link below to share it. Thanks so much for doing so. You will receive useful gifts when you submit the form. ** You are at He Expressed His Love and Disappeared!. ** Read the resolution to this love problem at He Expressed His Love and Disappeared! - Comments. ** Read the entry to this love problem at Love Problem Solution. ** Request Love Consultation Services through the form at Online Love Consulting Services. ** Forward Wise Biz to your friends and help discover good things in tho network and encourage them to share it. You'll get gifts when you forward or confirm your subscription to the newsletter. The gifts show you how to use one of your hobbies to build it a business on a solid grounds. Then you'll find that business generating income for you when you graduate to continue with it and improve your life. You'll never need to work for a company. ** If you are in any place in Nepal, write about it and upload beautiful pictures at Any Beautiful City.